5000 ft. is pretty long for a fixed quad. If they don’t want the extra cost or attention from a high speed quad, I’d prefer to see a triple to help cut down on ride time. Are fixed grip triples able to run at a higher line speed than FG quads? Would the installation of a chairkit carpet or other carpet allow the lift to be run at a higher than normal line speed without needing to be detachable? Per ANSI B.77-1, a fixed grip triple chair can operate at 500 feet per minute(fpm) while a fixed grip quad chair can operate at 450 fpm. Technically, adding a loading conveyor does not allow you to increase lift speed because the requirement for line speed relates to both loading and unloading. If conveyors were added at loading and unloading, then the line speed for a fixed grip quad could be increased to 450 fpm + the speed of the conveyors which is 200 fpm maximum. Also, a conveyor requires a “access regulating device” or simply a Loading Gate. BUT if you operate at over 600 fpm you are also required to add a cable position detector on each sheave unit. $$$$ but still cheaper than a detachable. Not under the published plan. That could probably be done separately with expedited approval as a one for one replacement. Twister is gone from this year’s trail map and may never be replaced. Is Twister being used anymore? 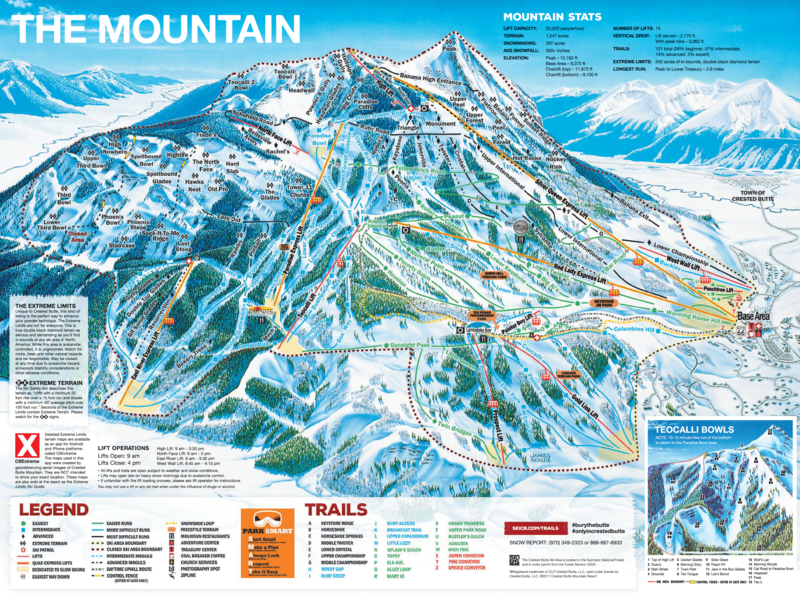 Crested Butte actually has 12 operating ski lifts: 4 high speed chairs, 6 fixed chairs and 2 high alpine t-bars. I like the proposal, but if they want to focus on intermediate terrain expansion then they should also include a new Teocalli express that extends from a much lower point. Same would go for Prospector, if they can. These (and most!) of the lifts at CB are short and slow. 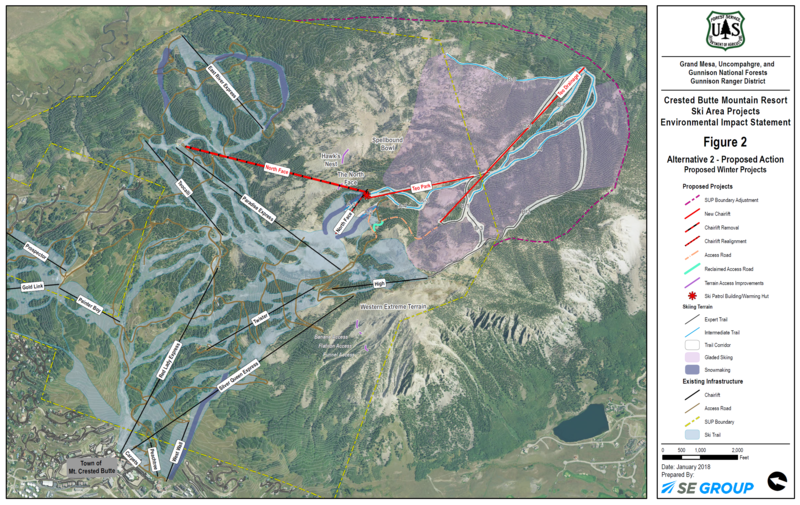 Extending these two lifts would bring the mountain together nicely. I think the proposal makes a ton of sense, but I think they need to make the new North Face and Teo drainage chairs high speed. They could limit the capacity like Aspen has done. Otherwise I think they will seriously regret not make these chairs detachables. That all sounds great but this season, none of those lifts would be able to open. Could there be something that could be done to open this terrain with less snow base? I like the idea of a triple with loading carpet for the upgraded North Face chair. Those fixed grip quads run way too slow and a detachable lift would bring too many people to the top of North Face who are in over their heads and end up getting injured and probably try to sue the resort because of it. I also would love to see an upgraded Teocalli lift, maybe with midsration where the top is now and top station at top of Twister. To answer the question about Twister lift, it is still standing, chairs still on the line and everything in tact. It has not been used in a few seasons and the bottom terminal has not been dug out which, unfortunately was much more noticeable last season than this season since Crested Butte currently has some of the worst conditions in the state right now. As much I would love to see all those new lifts go in this summer, the owners may want to monitor snowfall over the next few seasons to be sure the investment will be worth it. Seems better to have two cheaper T bars stand unused most of the season than a multi million dollar detachable lift and two additional aerial lifts… Hopefully the snowfall will pick up again and I will be able to experience the expansion while I am still young enough to enjoy it and others will too.